Habitat loss is a continuing threat to jacamars. In Brazil, intensive clearance of understory vegetation in forest frag ments caused a decline of jacamar populations, along with an overall lack of bird species diversity in the area. Only one jacamar species, the three-toed jacamar, is classified as Endangered. 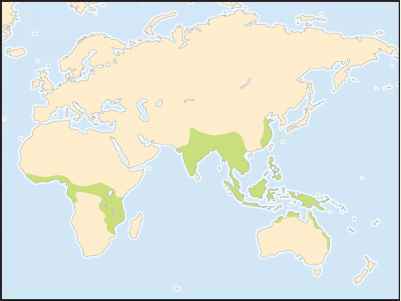 This species prefers lowland tropical rainforest, plantations, tropical monsoon, and dry forest. The three-toed jacamar used to thrive in southeast Brazil, including eastern Minas Gerais, Espirito Santo, Rio de Janeiro, Sao Paulo, and Paraná. Development and agricultural land use have destroyed much of its habitat. The remaining population, restricted to Rio Paraiba valley in Rio de Janeiro and the dry regions of Minas Gerais, is small and fragmented. The three-toed jacamar is protected under national law in Brazil. The Caratinga Reserve in Brazil offers a safe haven for this endangered species. The coppery-chested jacamar—found in montane tropical rainforests of Colombia, Ecuador, and Amazonian Brazil—is classified as Vulnerable. Its total population is believed to be small and declining due to destruction of its forest habitat.